Last edited by maddkat; 06-13-2018 at 06:01 AM. rainbow1, DaisyTweets, txacar and 3 others like this. Awesome! Great to see Carrie adding more shows. Hopefully a tour isn’t too far away. Really want to see her live again. WoW! Maybe this will stop the worry about Spotify!! txacar and countrymusicfan15 like this. Carrie on Spotify’s Instagram Stories. txacar, DaisyTweets, rainbow1 and 2 others like this. How accurate do you think this price range will be? Me and my sister and flying out of NY on the 5th so she texted me about going to NY a day early to see the show but our price cap was $60 since we are already paying for flights and everything! I want to go so bad! I haven't seen Carrie live since 2012 on the BA tour!! 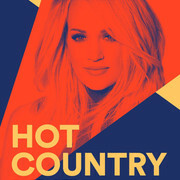 Multi-platinum selling and seven-time Grammy Award winning global music superstar Carrie Underwood will headline the inaugural Hot Country Live concert at the Seaport’s The Rooftop at Pier 17 concert venue, performing her biggest hits, including her current single “Cry Pretty,” from her first studio album on Capitol Records Nashville, which will be released on September 14. DaisyTweets and teesharky like this. Will we be able to live stream it on Spotify? This is so cool! I'm hopefully getting tickets to this today! rainbow1 and Kizmet311 like this. This is great news! Love that she is doing more if this kind of PR and Mainstream ARtist events. Got my tickets!! And entered the M&G contest on the Fan Club. There were actually like no Fan Club tickets available but Spotify emailed me right at 10 with a code for the Fans First access. Hey, can you share the code?? I can’t get anything. If you don't mind me asking, how much were the tickets? And yeah does anyone have any idea where to go to look at tickets other than being in the FC? I'm not getting anything. I've tried the Fan Club pre-sale and Spotify, but nothing. can't get it unlocked or buy? So that you may continue to shop, we recommend using a different device (laptop, phone, tablet, etc.). Using a shared device? Make sure you're logged into your Ticketmaster account. I wasn't able to get anything using the Fan Club Presale. The Carrie presale is "CRYPRETTY" and that's what I used to get mine. I believe they only release a select amount for the presale because they have to still have some for the GP sale. Just won a meet & greet for this!! maddkat, Kizmet311, Suellen and 1 others like this.